Dropbox, everyone’s favorite alternative to Apple’s iDisk, announced a major app update on Wednesday as well as a new App Directory. Dropbox 1.3 for iOS offers automatic offline caching for recently opened files, support for uploading HD video and high-res photos from the iPhone 4, and a redesigned home screen. The new version now displays upload progress and full-screen documents while in landscape orientation. It adds support for multitasking under iOS 4, allowing users to upload and download files in the background. Dropbox also announced a new App Directory to catalog the growing number of apps that use its cloud file storage services, such as GoodReader, Elements, and Documents To Go. The App Directory sounds similar to the Evernote Trunk feature launched by information-storage provider Evernote this summer as an in-app showcase for products, services, and content that bring added functionality to its users. 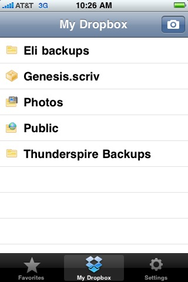 Dropbox is a universal and free app that requires an iPhone, iPad, or iPod touch running iOS 3.1 or later. It is available now for free in the App Store.